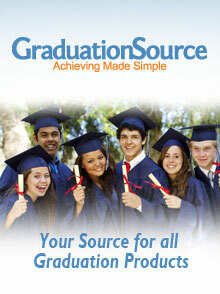 The GraduationSource coupon code makes this your ultimate graduation source, outfitting graduates of all ages with an honorable selection of cap and gowns, diplomas and accessories. Graduation Cap and Gowns - GraduationSource is your leading online source for everything for the graduate, featuring traditional graduation cap and gowns, tassels, diplomas and accessories for all ages and graduating classes. From pint sized robes for toddlers to Middle and High School graduation gowns, you'll find matte and shiny gown options with coordinating caps available in a wide range of colors and sizes for Preschool - Kindergarten graduation, Elementary - High School, and College - Faculty Regalia. Order graduation cap and gowns separately, or in convenient all-inclusive cap, gown and tassel combination packages. High School Graduation Apparel & Accessories - Prep your High School seniors with everything they need to celebrate their pomp and circumstance with an affordable selection of graduation attire and accessories, featuring graduation gowns that are available in 15 popular colors, in sizes that are guaranteed to fit any young adult. You'll also find a wide selection of matching High School graduations caps and tassels, High School honor cords, diploma accessories, and more. Graduation Diplomas and Diploma Covers - Whether you're preparing for a Preschool or Kindergarten graduation, a High School or College graduation ceremony, GraduationSource equips you with a complete selection of diplomas and diploma covers that will have all of your Pre K through College graduates covered. Choose from stock diplomas or custom diplomas that can be customized with your own calligraphy, gold seals and other embellishments, as well as colorful and sturdy diploma covers that will protect the symbol of their incredible achievement, now and for years to come. Faculty & College Graduation - Help your graduates suit up to accept their Bachelors, Masters and Doctorate degrees with a collegiate collection of graduation cap and gowns, hoods, tassels and tams that that are suitable for students as well as college faculty members. Provide them with the attire and accessories that will salute, celebrate and acknowledge this monumental milestone with graduation gowns sized by height, designed to accommodate 4'6" graduates, 6'11" graduates, and all sizes in between. Graduation Accessories - GraduationSource accessorizes your graduates in style, with all of the accessories and decorations that they need to accept their diplomas with dignity and pride. Find single color, double color, or red white and blue colored tassels that will complement and coordinate with any graduation cap and gown color theme. You'll also find academic medals for your Valedictorians, Salutatorians and Honor students, white graduation collars, Honor cords, and plain, stock and custom imprinted stoles and sashes that are at the top of their class. Since 1960, GraduationSource has served and satisfied over 30,000 schools worldwide, supplying them with a full line of premium graduation caps and gowns, regalia and accessories that help celebrate every age and every graduating class, with honors.